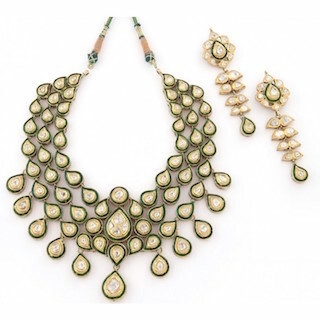 8 Gorgeous Kundan Sets For The Modern Bride! You’ve got your dream lehenga ready, the most important part now is to choose the jewellery that will match with your outfit and your personality effortlessly. 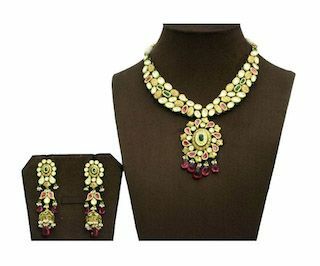 Whether it is polki and kundan or just diamonds that you plan to wear, looking at the different varieties will help you make the choice easily. 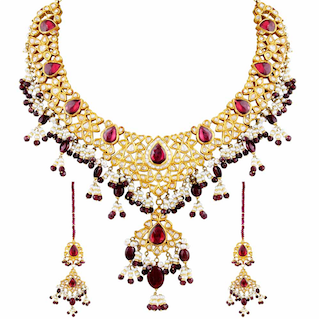 We’ve put together eight unique designs in kundan jewellery that will make your selection easier. Have a look! Go big, or go home! If that’s your mantra in life, maybe you’ll like this too! 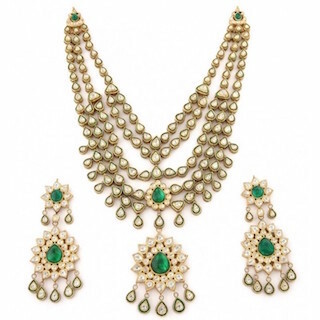 The five haar necklace along with the magnificent earrings are quite a showstopper. The tiny tear-shaped droplets give it that beautiful touch, don’t you agree? Price: Rs 2,78,220. Buy it here. If you are someone who prefers neat cuts that speak loudly, this has to be your choice. The larger-than-life stone sizes and the clean design makes this one totally wearable. It’s unique, special and will compliment the lehenga pretty well! Price: Rs 2,03,384. Buy it here. For the woman who has a lot going on in the outfit. 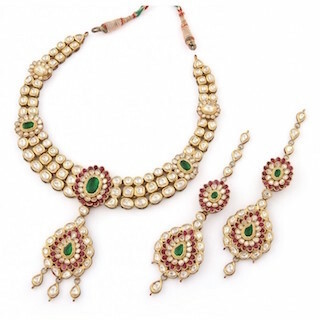 When the blouse and the dupatta is covered in shiny detailing, this simple wreath necklace is ideal. It’s got triangles and round shapes all around, with dainty earrings. You could wear this along with a longer pendant necklace as well. Price: Rs 1,68,100. Buy it here. This one is perfect when you are wearing a blouse that is deep-cut. It sits beautifully on the neck and the stones sparkle from far away! The green and red combination sprinkled all around gives it a bridal touch, just what you were looking for! Price: Rs 3,01,540. Buy it here. 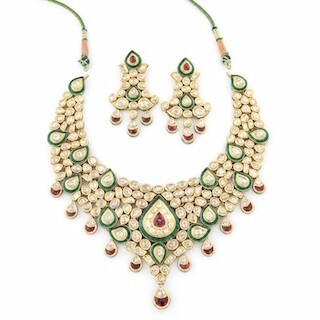 Tiny little droplets of beads all around the earrings and necklace makes us imagine how this will keep dancing around with every twirl, with every movement. It becomes a part of you, when you wear this. 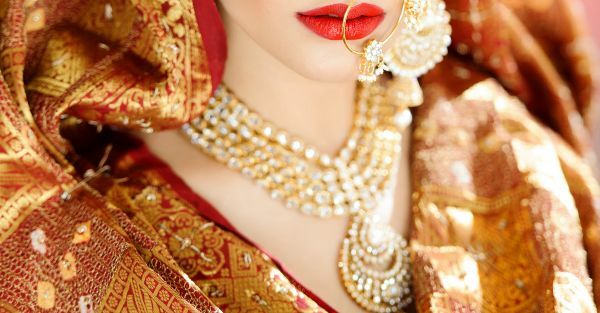 The intricately designed gold elements give it that finesse that we all hope for in our bridal jewellery. Price: Rs 4,82780. Buy it here. 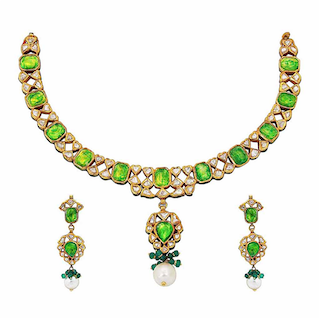 Something that’ll totally stand out when you are wearing a red lehenga is this green kundan necklace and earrings set. 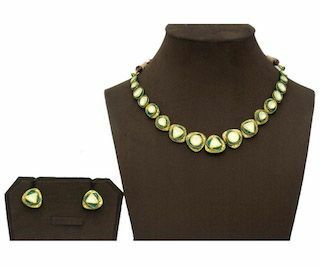 The bright squared green stones with rounded edges and the crisscross work all over are a stunning combination. The way they are married together in this set makes us want to get married in this! Price: Rs 1,56,651. Buy it here. A necklace that looks almost like a collar, this one is pretty unusual. We especially dig the round pendant - it’s distinctive in style with carefully carved elements, and the sizeable drops give this that royal vibe. The earrings are luxuriant too. Price: Rs 4,40,900. Buy it here. A contemporary touch to the traditional - done right. Along with the linear placements of stones, the flowers placed all around lend it a strong character. The huge pendant adds grace to the whole look. The earrings are delightful too. This set spells “Here comes the bride” pretty loudly!